The Arrival Review: The title and the front page hint at the story within. Surely one of the more incongruent title pages for a children's book. The cover features the image of a man dressed in a crumpled suit, suitcase in hand, not unlike something out of a 1930's depression era photo, peering down at what appears to be a cross between a tadpole and a dog. The opening chapter features a range of exquisitely drawn illustrations about a man who leaves behind his young family, to go on a long journey across the ocean. The man's goal is to create a new life for his small family in a distant land. The Arrival features no text. The story is generated and propelled by the lush illustrations. The effect is similar to watching a silent era black and white movie. 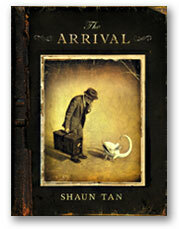 The Arrival is less a picture book and more a true graphic novel. This is apparent with Shaun Tan's consistent use of nine and twelve panel sequence of pictures on a single page, a technique more akin to graphic novels than to picture books. The Arrival is a beautifully presented book on large glossy paper. The book has a hard cover that resembles an old photo album, a golden sash as a book mark and lovely sepia toned images to go with the charcoal drawings. The beauty of the book's presentation is rivalled by the heart-rending story within its glossy pages. The Arrival is the story of immigration. Close examination of the images reveals much. We feel the man's anguish at separation from his family, we sense the man's confusion and wonder in the new land and feel the full horror of the experiences of other recent arrivals as they narrate their stories to the man. Complex language and a range of human emotion is communicated without the use of text, and is a real achievement. All of the emotion is communicated through images. We seem to be living in a golden age of children's literature. Over the past few years we've been treated to several children's books which surely compare favourably to the best in modern times: The Invention of Hugo Cabret , The Miraculous Journey of Edward Tulane , and Shaun Tan's, The Arrival. The Arrival is recommended for upper primary and secondary school students. Many of the sequences and images are sophisiticated and may require some scaffolding for students to unlock the deeper meaning of the story.